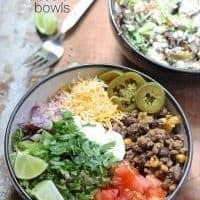 This recipe for loaded burrito bowls will hit the spot if you have picky eaters or need to eat dinner quick. Load the table with a variety of burrito fillings to make this everyone’s favorite! What a whirlwind of a month. Or a year. I keep taking on more and more tasks and I find I’m having less and less time to get the things I want done done. I’m even repeating words more often. I cook a lot as you can imagine, but it’s not always things you can eat for breakfast, lunch or dinner. If I’m making desserts or snacks, I still need to cook something we can actually eat. As much as I hate to admit it, we can’t keep eating cupcakes for dinner and I should really refrain from eatings cookies for breakfast. So if I’m not eating cupcakes or cookies all day, what am I eating? If I made a big batch of this burrito meat, we could eat these for burrito bowls for lunch and dinner for a few days. And maybe, just maybe, I could just do nothing at all for a couple of hours. Or I can make a few extra cookie batches. The greatest thing about my loaded burrito bowls is the flexibility. You could literally put whatever you want on your bowl so this is great for picky eater households. Start making your rice, make your meat mixture (ground beef. and beans. and corn. oh. my.) and then pile on your toppings. I know I’m not the first person in the world to make loaded burrito bowls but that doesn’t make this recipe less delicious. Enjoy! If you have picky eaters or need to eat dinner quick, this recipe for loaded burrito bowls will hit the spot! In a pan, brown your ground beef. Drain excess fat from ground beef, then add the black beans, corn, taco seasoning and water. Stir and simmer for 15 minutes, then turn off heat. 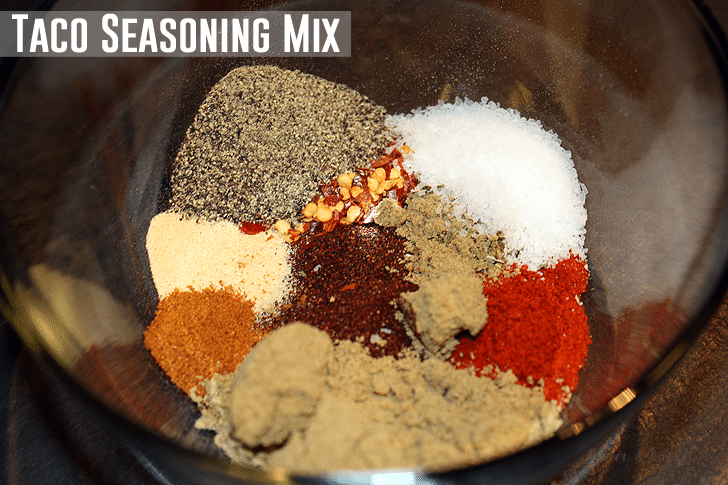 Put 1 cup of meat mixture in a bowl and then pile on the optional toppings. 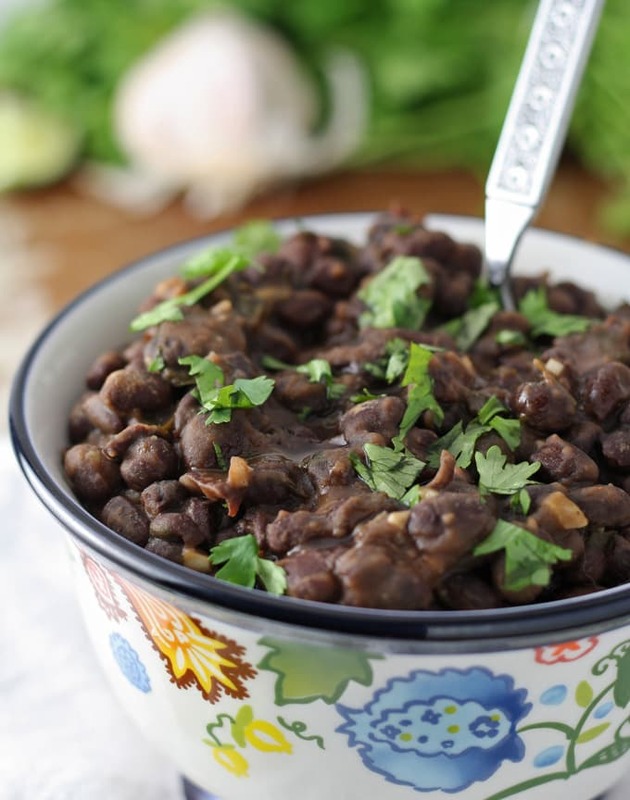 or this seasoned black bean side dish. Sorry to hear of the reasons for your tiredness …. your burrito bowls look like just the ticket to a simple dinner. thanks! Thank you Courtney, and you’re welcome! This is a really yummy looking bowl. I might have this for supper tonight! That’s what I always order at Chipotle! This sounds really good. I love a burrito. I never thought to serve it up this way. It would be perfect for me because I have trouble eating any type of bread. I saw this in your email newsletter earlier and meant to hop over to check out your recipe! I am glad you linked it up with us at #FoodieFridays! 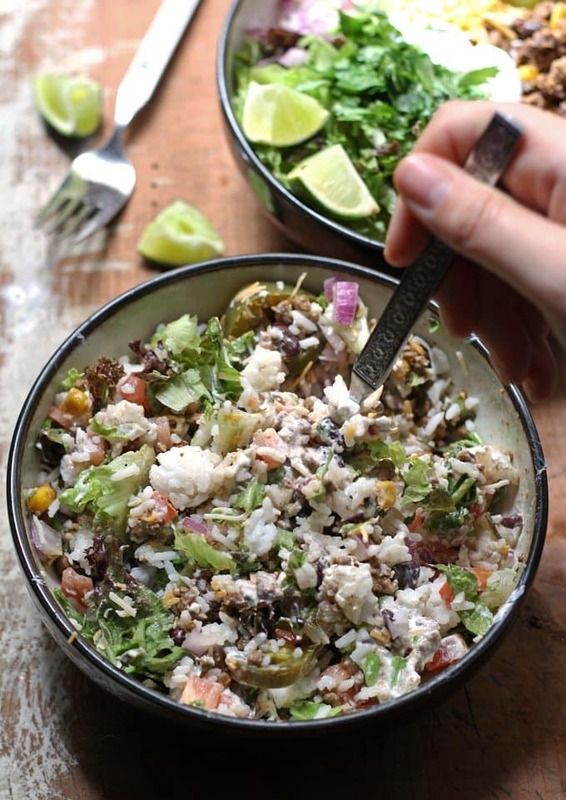 This kind of recipe is totally up my alley…I love burritos and burrito bowls. I’m pinning and stumbling, and I’ll be sharing this on my Facebook page on Saturday. I cannot wait to try it! Sorry about your mom. 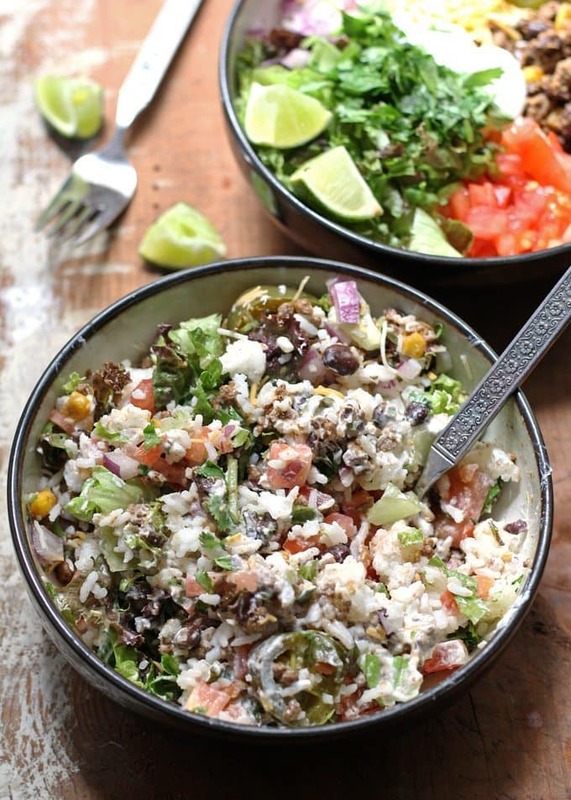 This burrito bowl looks delish! Pinning. I definitely will be making burrito bowls for dinner tonight.. thanks for the inspiration, these look so delicious! So sorry about your mom! We are going through that with my mom in law (who is now on hospice) and it’s so weird to carry on in your real life and have things like blog posts and whatevers. Just weird sometimes. Thanks for sharing this recipe! This looks delicious! I am going to make these for my husband. 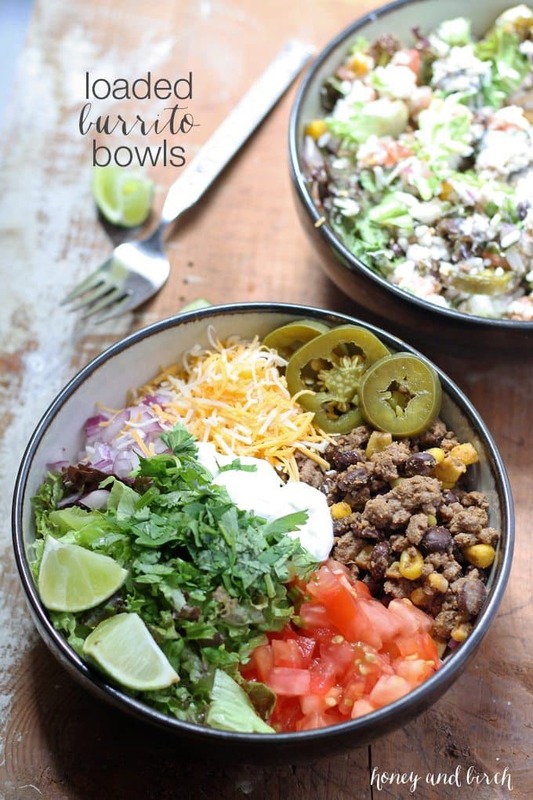 Burrito bowls are one of our favorite weeknight dinners! I love how flexible they are. I found this through a collection that Michelle at A Dish of Daily Life shared. I am looking for more quick and easy weeknight meals, and this one looks great. That’s awesome Gaye! We eat it a few times a month – its very easy to make and great as leftovers! This looks really delicious – a perfect lunch! Thanks for sharing at the What’s for Dinner linky – and don’t forget to leave a comment – if you comment and your post is featured next week, it will also get pinned and tweeted! Yum! We do a meatless version of this at my house with quinoa, black beans, and lots of lime and cilantro. It’s so delicious. Keeps my meat-loving husband satisfied too! Thanks for sharing on the linky! What a great lunch idea. Looks very delicious too! Just like a naked burrito bowl from Qdoba. So smart to make them at home. Thank you for sharing on Family Joy Blog Link-Up Party. Hope you are having a great week! Looks so good. I know this would be a winner for our family. 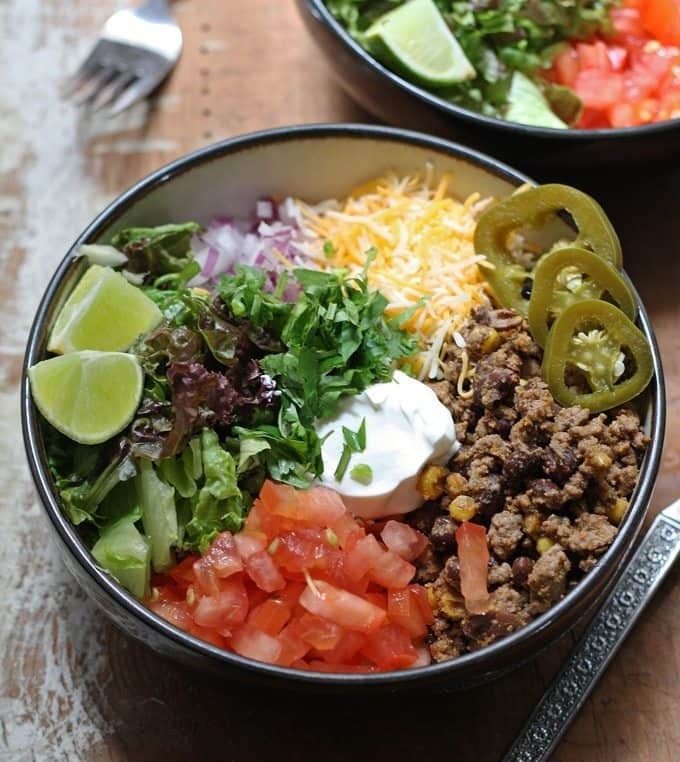 Loaded burrito bowls are so good! Your photos look amazing and now I’m super hungry! Thanks for sharing at #HomeMattersParty Hope to see you back!